Mattia Gallo: What are the reasons that led so many people to demonstrate in Beirut in recent days? How did the protests start? What are the claims, slogans, and demands of the people who took to the streets? Elias El Khazen: Since the end of July, protests have been occurring in Lebanon against the failure of the Lebanese state, in its two instantiations, the pro-Syrian March 8th and the anti-Syrian March 14th coalitions, which have taken turns governing the country for the last decade, to agree on a new contract for waste disposal and the consequent build-up of rubbish in the streets. 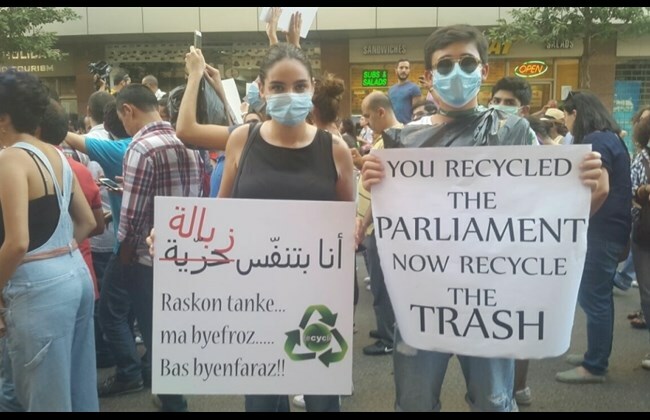 Some of these protests took place spontaneously in poorer neighbourhoods where since 1998, after the main landfill in the south of Beirut (Naameh) reached capacity and the government failed to find a substitute. Others were organised by social media campaigners using the hashtag ‘YouStink’. The demonstrations reached their peak on the 29rd of August, when tens of thousands of people–some estimates say up to 100,000–converged to protest against both poles of the ruling class on August 29th and to contest, among other things, the unprecedented state violence that occurred at the August 22nd demonstration and the other protests that followed. 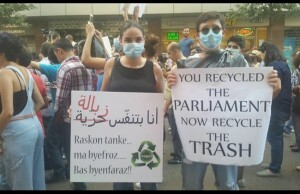 The protesters’ demands range between the official statement of the YouStink organizers, whose reformist agenda includes the resignations of both the environment minister and the interior security minister, and the decentralization of the recycling of waste from the municipality, on the one hand, and more radical and revolutionary demands for the dissolution of the parliament, early elections on the basis of non-sectarian proportional representation, and the linking socio-economic struggles to take down the regime as a whole, on the other. The latter have been bolstered by the formation of popular committees everywhere. MG: What was the reaction of the mainstream media and the political class to the protests? How repressive was the police? EK: On August 22nd, riot police and soldiers used their batons, water cannons, tear gas and even live ammunition against thousands of protesters who had gathered in downtown Beirut. The rhetoric that preceded that oppression by the state was one initially started by the YouStink organizers, who labeled a considerate portion of fellow protesters “infiltrators” and “provocateurs” and thus gave a carte blanche for the repression that followed. Luckily, most protesters co-opted and reclaimed the “infiltrators” label and countered the attempt to divide the movement into “peaceful” civil society rallying in Martyr’s square and “violent infiltrators” rallying in Riad el Solh square, shouting slogans like “We are ALL infiltrators, we don’t need educated activists to label us,” wearing it on their T-shirts and painting it on walls. MG: Lebanon is at the heart of the Middle East, bordered by Syria and Israel. How is the country affected by the Syrian crisis? What are the relations with Israel today? EK: Lebanon has been hugely affected by its neighbors and has in turn returned the favor. Firstly, Israel has invaded Lebanon countless times, creating void and meaningless reasons to invade, bombing many villages and towns, destroying infrastructure and killing civilians. Israel’s aggression of 2006 was the latest example of an intervention that diminished Lebanon’s ability to stand on its own feet. This is not taking away from the corrupt political class, which has governed Lebanon since the end of the civil war and has failed miserably in providing the most basic of services to the people residing in Lebanon. On the contrary, both governing coalitions have presided over the continuation of neoliberal policies and the continuation of protecting the banking sector, which owns more than 60% of the public debt. As for the Syrian regime, it has been intrinsically linked with the Lebanese ruling class since its occupation of Lebanon in 1976. With the start of Syrian revolution in 2011, Hezbollah (part of the March 8th coalition) has been involved in saving the Syrian regime from totally collapsing since 2012. This in turn has polarized the political scene in Lebanon and made the defense of the regime Hezbollah’s sole raison d’etre since defeating Israel in 2006. With the escalation of neoliberal policies in recent years through privatization and cuts on employees benefits, many sections of the Lebanese population who used to support Hezbollah are questioning their allegiance and reconsidering whether it is still a meaningful sacrifice that their working-class children should be sent to die in Syria in vain while they sit in their homes with very limited access to water, electricity and other basic services. The August 29th demonstration has seen the biggest influx of working-class sections, who are suffering the most from the waste management crisis and other crises from both the suburbs of Beirut and rural areas with local organizing in that latter still in its infancy. Moreover, it is precisely the Syrian refugees are the ones who are bearing the brunt of the waste management crisis and other socio-economic crises, but are unfortunately excluded from any protest or demonstration for their most basic rights as the Lebanese state has made sure to alienate them both physically and ideologically from any possibility of collective organizing or unionizing. MG: What is Socialist Forum? When was it born? What are its political perspectives? EK: The Socialist Forum is a revolutionary socialist organization in Lebanon. It came out of a merger between two Trotskyist groups in 2010. But each group dates back a while. One of them started in 2000 and the other started in the 1970s. As a result of this background, in the Socialist Forum, we have two publications. One of them is an online daily Al-Manshour.Org. The other one is an Arab periodical journal, which is published twice a year like a book, together with other groups from Egypt, Syria, Tunisia, Morocco and Iraq. Its name is Thawra Daima, which in English translates to Permanent Revolution. Our groups supported Arab uprisings and the wave of uprisings around the world that began at that time. We see that the current situation requires a synthesis of resistance to capitalism and resistance against dictatorship, and for progressive democracy. The Socialist Forum is also a founding entity of the Al shaab youreed movement formed in the aftermath of the August 22nd protest. This movement regroups students, radical feminists, leftists, and independent activists under the banner of one movement and aims to elevate the political discussion to a more structural view of the ongoing crises while linking them to other struggles. Our strategy is to move towards forming a political party, a revolutionary party in Lebanon. Mattia Gallo is an Italian journalist and media activist. He is from Cosenza, a city in a region of Calabria in South Italy. He wrote, and in some cases continues to write, for newspaper and alternative media of his region (Ciroma.org, Tamtamesegnalidifumo, Il Quotidiano della Calabria, Fatti al Cubo, Esodoweb). He has published several articles on Italian alternative media of extra-parliamentary movements as Dinamo Press, Global Project, Ya Basta!, Sportallarovescia.it. Elias El Khazen, 29, is an activist of Beirut’s Socialist Forum.